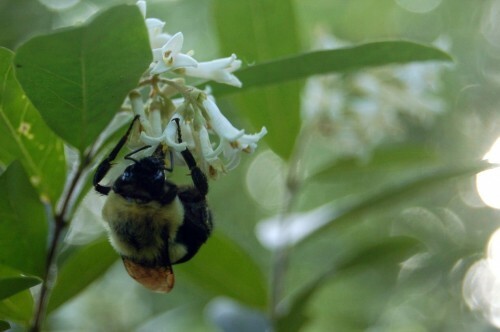 This bee isn't actually greedy, he just looks like it. If you go to enough environmental activist group meetings, you are bound to hear, at some point, “What we need is more education”; the assumption being that the general public is too ill-informed to know that their behaviours are causing Issue X (biodiversity loss, climate change, smog, ozone depletion, mountain-top removal, whatever), and that if only they knew better, true and correct behaviours would flow forth naturally from their hands and hearts forevermore. It’s interest and passion that drive the need to be well-informed, not vice-versa. Pouring knowledge, statistics and information into the cranium of an otherwise unmotivated person is precisely like pouring boiling water into a candle-mold: it won’t stick, and you’ll get them all steamed up. More importantly, education does not transform behaviour without a great deal of forethought, planning, audience-targeting, message-crafting and follow-up–and even then, Dear Readers, it’s a tough slog. The general public is already overwhelmed with information that they perceive to be irrelevant to their lives, overly complicated or technical, outside of their control, or too frightening to be entertained. Your educational efforts on Issue X when directed towards someone who is uninterested or frightened will almost certainly go to waste, and may be perceived as harassing or worse. Environmental psychologists have been puzzling over the interesting quandary of what exactly gets people to adopt pro-environmental behaviours (PEB–I do love good jargon) with increasing alarm over the past several decades. Are you ready? It’s not what you think. OK, it’s not just values; but values count. But! Researchers also learned that they could manipulate a person’s value system: for example, by “priming” someone with exposure to nature, either through images or through going to natural settings, a person’s value system notably shifted towards biospheric orientations. Whereas priming someone with a message about how adopting PEB X–let’s say, compact-fluorescent lightbulbs, programmable thermostats and fuel-efficient cars–benefited them, their values shifted towards egoistic and they became less likely to adopt PEB in other areas, where it might cost them. Your kindergarten teacher was right, and the geniuses in charge of Wall Street are wrong: greed is not good. Sharing is good. Greed is bad. Greed is the end of human civilization: the rampant and uncaring destruction of any ecosystem we personally can’t live in where we can derive temporary and short-term economic benefit by such destruction; the devil-may-care extinction of 50-150 species per day on the basis that we personally can’t miss what we never knew; the theft of a viable future from our grandchildren by wanton disregard for atmospheric physics today; the insatiable modern consumer appetite for stuff over any thing that might actually matter (more on that one next time); greed kills. Those who promote greed as an answer to any significant problem ought to be tarred, feathered, and lit on fire in a public square. OK, not really (I’m too nice for that–I have a biospheric values orientation). But greed is not the answer. When you appeal to people on the basis of greed, you teach them to be greedy. I’m not claiming that greed has never motivated the development of a system or technology with the capacity to be a solution to our environmental problems; it has. But greed prevents us from adopting those systems and technologies in any useful way by encouraging us to spend our savings instead of saving it, as per the Rebound Effect. The Rebound Effect is greed in action. Selling pro-environmental behaviours on the basis of perceived self-interest backfires, and it backfires spectacularly. Stop doing it. If you want to save the world–or, if you’d like to move the general public a little bit closer towards a sustainable society on Issue X–move your audience closer to a biospheric values orientation. ** The farther they shift towards caring about living things in a global sense, the more receptive they will be to your educational efforts and the more likely they are to adopt pro-environmental behaviours even when expensive or inconvenient. Whereas when you sell the public on a pro-environmental behaviour on the basis of self-interest, that is exactly what they will do. And that is all they will do. When it’s easy. When it’s cheap. When it affects them personally. And nothing else. Next up: why modern greed is the biggest shill ever devised, and how shifting towards biospheric values not only opens up space for rainforests, endangered species of frogs and impoverished third-world villages, but for happiness too. *I’ve posted an annotated bibliography on my favourite papers on this subspecies of environmental psychology for the viewing pleasure of anyone interested in where to go for more information or to track down sources and statistics. Enjoy. **What that means and how it works is a post for another day, but as a first step: encourage connections and identifications with non-human nature; talk about values–the kind of people we want to be, the kind of world we want to live in, the dreams we have for our children. Looking at this picture may make you a better person. Maybe it’s not that nice people care about the world and get involved in issues like environmentalism. Maybe it’s that people who spend time outside grow both to become more altruistic and more attached to the environment, and express both of those values through activism and in their personal lives. Or maybe other recent studies are right and people who do the right green thing often offset that by screwing other people over. Of course, that study did nothing to differentiate those who act on environmental issues out of guilt vs. love, or obligation vs. desire. My guess is that those who buy recycled paper products because they love nature will not show the same behavioural patterns as those who buy them because they’re sick to death of the kids haranguing them. Much like someone who eats fruit because they like fruit will probably not eat as much cake later as someone who eats fruit because the kids are watching and the doctor’s been bugging them to lose twenty pounds. Of course this is entirely speculative. But evidence from environmental psychology has been piling up for a few decades now: exposure to nature is good for us; or, phrased in a more evolutionarily-correct way, nature-deprivation is very very bad for us. People in hospital rooms with a view of a tree heal faster. Walking in nature is more restorative and restful than walking on a city street. No, never mind, just go read Richard Louv’s Last Child In the Woods, and if that doesn’t convince you that adults and children both need non-human nature in their lives on a regular basis, nothing ever will. And then maybe stop trying to goad your children into behaving better by surrounding them with Proper Moral Messages in book and television form, and supplement that with a few trees and flowers. You’ve got to admit that’s more appealing than yet another half-hour show with a Very Important Lesson learned in the last ninety seconds and delivered at super-human pitch. Trees and flowers: prettier, quieter, and they make you a better parent, too. *By the way, the author of the SciAm blog post, P. Wesley Schultz, is one of the major researchers in environmental psychology. He knows whereof he speaks. Pardon the pun: my recent mini-article on Wind Turbine Syndrome for This magazine has gone on-line. And yes, I still intend to write something here before August. Promise! I may be a bit quieter for the next couple of weeks while I work on a new article about wind power, this one about the issues around siting wind turbines or wind farms in and near Toronto. We have one (at the Ex) and if Toronto Hydro gets the results they want from the anemometer off the Scarborough Bluffs, we could have a bunch more. This ruffles all of the usual feathers. But where exactly are we supposed to build them? Everyone likes renewable energy–and every opponent of any given wind project I’ve interviewed has said that at least once, so it must be true–but somewhere else, apparently. The technical siting constraints are considerable: you need to have enough wind; you need to have enough space; you don’t want to build it in a migratory zone for birds or bats, and you don’t want to chop down significant habitats to construct them. So you might think empty country is better–but then how do you connect them to the grid? Miles and miles of transmission cable aren’t exactly environmentally friendly, plus you lose more electricity in the lines the farther it has to travel. From an economic perspective and from certain environmental perspectives, producing electricity where it will be consumed makes sense. Just like growing food where it’s going to be eaten. I have no answers yet, and twenty-five days to come up with some and put them in a well-written and persuasive article. Wish me luck. I’d love to hear your thoughts on the issue of mixing wind turbines and cities. Would you want one in your backyard? Close enough to see it in the distance from your kitchen window? Are they modern works of art or eyesores? If you live in Toronto, what do you think about the WindShare turbine at the Ex and Toronto Hydro’s hoped-for plans off the Scarborough Bluffs? Where should they go, and why? Want to have an easier time acting on environmental issues? Find a(nother) source of meaning or purpose? Be happier? There’s one simple thing you can do to achieve all three: go for a walk. In other words, nothing to sneeze at. But how do you go about increasing your sense of connection to nature? It’s as simple as going outside. Subsequent studies have shown that spending even small amounts of time in non-human environments–even wild-animal parks or, in some cases, watching nature videos (though the effects were not as large)–increases a person’s sense of connection to nature. Which probably explains why this running-biking-park walking-gardening nature-lover can get a tank of gas to last for three months and is spending her work-life and her free time on environmental issues (my score on the scale was about 4.99/5; the mean was about 3.6 and most people fell between 3 and 4.2. I’d post it here but I’m cautious about copyright infringement). It might also be why as a type 1 diabetic single mom of a little girl with an undiagnosable genetic form of dwarfism I am, most of the time, pretty happy, even though I spend a couple of hours every day steeped in climate catastrophe, mass extinction and ecosystem collapse. Anecdotal evidence, I know. But what do you have to lose? Go for a walk. Schultz, Wesley P. & Jennifer Tabanico. “Self, Identity and the Natural Environment: Exploring Implicit Connections with Nature.” Journal of Applied Social Psychology (2007) 37: 6. Climate change often sounds like it’s something that happens somewhere else: the ice at the poles melts, island nations (and manhattan) go under water, more Category 5 hurricanes in the Gulf of Mexico. But what about Toronto? OK, summer’s hotter, winter’s warmer, especially at night–does that sound so bad? (Though keep in mind that more heat means more smog, and smog kills about 1,700 people each year in Toronto.) A longer growing season? More shorts weather? We’re going to complain? Well, yes. For one thing, those catastrophic weather events will hit here too; in fact, that thunderstorm a couple weeks ago with winds so strong they ripped the heating and cooling equipment off the roof of my office building is exactly the kind of thing that climate change predicts for Toronto. But forget about that. Humans are actually not the only living things in the city. Let’s take one example: birds. 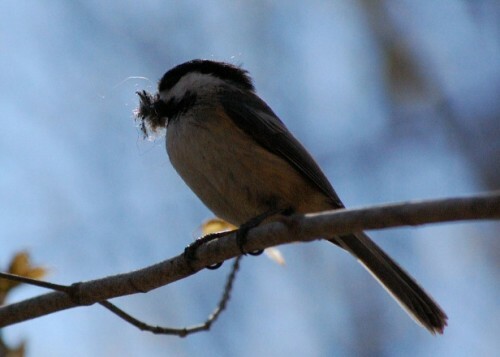 Bird species that over-winter, such as chickadees, may increase. Winter will not be as deadly; food will arrive earlier in the spring. But migratory songbirds (whose populations have already declined by over 50% over the last four decades as a result of habitat fragmentation, pesticides, lighted office towers and tropical/boreal deforestation) will not fare so well. Their migration is frequently driven by hours of sunlight; but the appearance of their food sources (plants, insects, etc.) is often driven by temperature. As climate change progresses and spring arrives earlier, the overlap of the migration routes and food sources will shrink, meaning that by the time the migratory songbirds get to Toronto their favourite tasty caterpillars will already have metamorphosed into butterflies and flown away. This effect is more pronounced among bird species that migrate over longer distances. Experts hypothesize that its easier for birds to respond to changing climates by changing the timing of migration when the distance is short–say, the mid-US to South Canada–because the climates are not as different, and the mid-US winter will offer clues about the onset of spring in South Canada. But birds that winter in the tropics and fly each spring to Canada’s northern boreal forests have no such clues, and their migration timing is not shifting in response to the changing climate. Sadly, those are the very species whose populations are most suffering already from the issues listed above. For all these reasons combined, experts estimate that 30% of migratory songbirds may go extinct with a change in temperature of 2.0 degrees Celsius (which we have now already committed to, thanks to carbon already released to the atmosphere). Hooded Warblers and Acadian Flycatchers are two songbird species that migrate to southern Ontario each year from the neotropics; thanks to the disappearance of their preferred Carolinian forest summer habitat locally, Acadian Flycatchers are listed as endangered and Hooded Warblers as threatened; both species are already shifting their habitat northward in response to warming, though how far north they can go when Carolinian forests only exist in southern Ontario is anyone’s guess. The American Bird Conservancy projects that a doubling of CO2 levels will see American Goldfinches move north of Toronto; we are already nearly there. So say goodbye to goldfinches, Hooded Warblers and Acadian Flycatchers; but you might be able to say hello to the Bobolink, a migratory songbird that currently lives only south of the Great Lakes but, due to warming, will soon be found, experts predict, only in Canada. Spring may not be silent in a few decades, but it sure won’t sound the same. My google alert on climate change in Canada has been faithfully telling me now for several days about an emerging global consensus that climate change is all a hoax. It’s all over the papers, apparently: all the scientists at the Heartland conference on climate change would like to assure the global public that there is no need for alarm and we can go on burning fossil fuels indefinitely (or at least until we run out–separate problem). Here’s the thing: If Will [conservative American columnist known largely for getting climate science embarassingly wrong and refusing to apologize] is right, and there is no global warming, then much of what we think we know about chemistry and biology and ecology and thermodynamics and geology and physics is wrong. If Will is right, then thousands of climatologists are not only wrong, but participating in a global conspiracy to conceal the truth about the state of the planet’s ecosystem. The climatologists have nothing to gain from perpetuating the “lie” of anthropogenic global warming, but they’re doing it anyway, just to be mean.